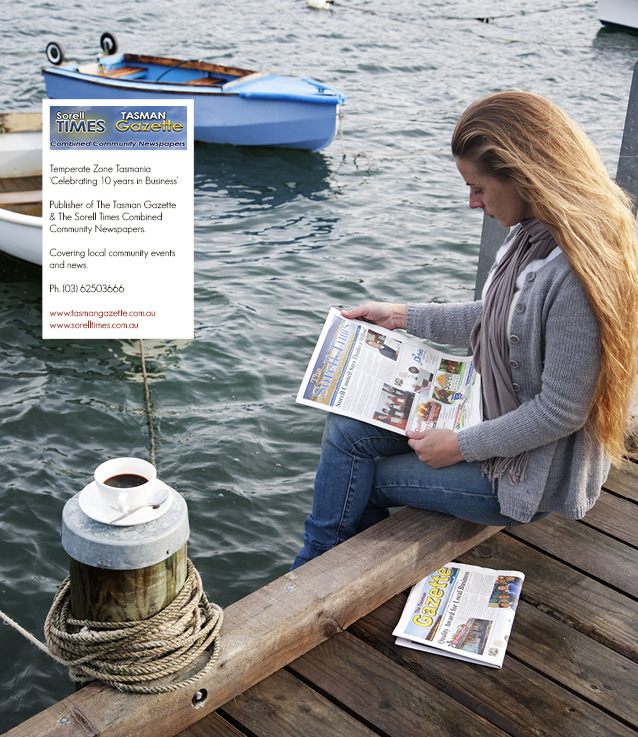 For local news and the best insider tips and information, you can’t beat the Sorell Times and Tasman Gazette. These publications provide local community news to a vast area incorporating the Tasman Peninsula through to Midway Point, encompassing all communities along the way. These publications continue to grow steadily, ensuring their longevity for all coverage areas. Now celebrating 10 years in business, the Sorell Times and Tasman Gazette employ local people both directly and indirectly, with some five freelance writers, graphic designer, bookkeeper, accountant and advertising consultant. The Sorell Times and Tasman Gazette are also available to read online from your handheld device or computer – what a fantastic service. These publications are an important way for our community to share news and inform one another of upcoming events and important issues. The BCFM Committee recognises the importance of communication in developing a strong community and warmly thank the Sorell Times and Tasman Gazette for their efforts and for their generous sponsorship of the Cook Book. If you are looking for a recipe for an old-fashioned favourite that will please everybody, you can’t go past the recipe for kiss biscuits below. They are a lovely Christmas pressie and the recipe can be easily doubled to make a few more! For more information about the Sorell Times and Tasman Gazette, visit the website or contact details are below. Cream butter and sugar until the mixture is a light cream in colour. Slowly stir in the lightly beaten eggs then gradually add sifted flour until combined into a dough. Roll out the dough to approximately half a centimetre thick and cut into rounds with a biscuit or scone cutter. Place onto a lightly floured baking tray and bake for 10-12 minutes or until lightly golden in colour. Set aside to cool. When completely cool, sandwich biscuits together with jam. For the icing, add 1-2 drops of red food colouring to the water. Mix butter and icing sugar in a bowl adding very small amounts of the coloured water until the mixture is just creamy. Pour the sprinkles onto a small plate. Ice the kiss biscuits and dip the top of each one into the sprinkles. Set aside until the icing sets and then serve. A small amount of raspberry jam may be substituted for the red food colouring and water mixture, this also adds a lovely flavour to the biscuits.